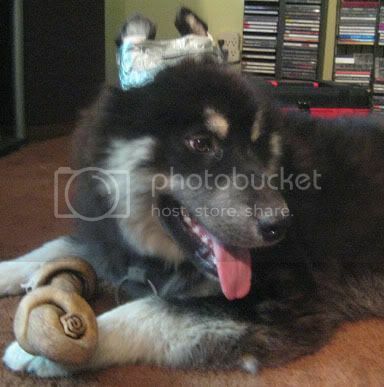 Some people prefer the look of the Malamute's wolf ears, however, in some cases a puppies ears never stand erect. First, you should know that floppy ears cause no known health risks and the decision to make them stand is strictly for aesthetics. Taping floppy ears up works magnificently. It takes 3 days to 2 weeks and your puppy's ears will be standing. The dog will get the tape off every other day, so you will become a professional at taping ears in no time. 1. Soft Jumbo Hair Rollers (at Walgreen's in the hair accessories isle). Get 2 packs. Put a thin layer of skin bond onto one side of the jumbo roller and press the roller into the pups ear canal, squeezing the ear in a cone shape around the roller. Hold for 30 seconds. When you release, try to prevent the pup from shaking it's ears for a few minutes. Cut off a 2 foot strip of the cloth medical tape. Wrap around the very base of the pups ear and around to the other ear in a figure 8 pattern, keeping the ears held as high as possible on the crown of the head. ONLY wrap tape 1/2 or 3/4 way up the pups ears or you could cut off circulation and loose an ear. Cut off a 2 foot strip of duct tape. Repeat previous step with duct tape. Make sure NOT to go above the white medical tape, but do ensure that some duct tape is fastened to the fur at the base of the ears or the pup will tear it right off. Sites that tell you not to get any kind of tape one the fur are just covering their backs for liability reasons. There is nothing wrong with duct taping over the cloth medical tape even getting some on the fur so long as you don't mind cutting the fur to get the tape off and you only tape half to 2/3 the way up, so their is proper blood circulation. Fur grows back in a few weeks, and your pups ears will stand forever. It is personal choice for you to make. You can not rip the tape off and try to spare the fur in any way- this could do serious skin/ nerve damage. The puppy will tear it off quite easily (1-2 days) but the durations he/she leaves it on will get longer and longer, and eventually it won't bother him too much at all. This will give you an opportunity to see where they are at and how much longer you need to keep them taped. 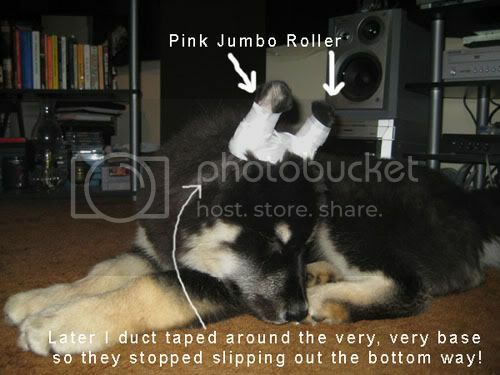 The puppy should not play with other dogs or pups while tape is on it's ears.